I spent the evening last night in a suite at Texas Stadium. No, I'm not a huge football fan, nor am I insanely wealthy. I just work for a family that shares some of its luxuries with their employees when they aren't using them. So, when the offer came to enjoy an NFL game, in the suite, I jumped at the chance. And believe me, it is the way to go .... to any type of sporting event. I am fortunate to work for a company that I like, for people that I enjoy working with and who appreciate me and my talents. God has definitely blessed me in my work. Why would I ever question that He won't bless me in other aspects of my life? God, please forgive me when I try to pin my agenda on you. When I want you to do things MY way. Please open my eyes to recognize that you are at work in every part of my life, even when I can't see it. On a typical Sunday afternoon, I come home from lunch after church, kick back, read the newspaper, maybe take a nap, then off to our weekly singles group meeting. Today, because we went to the Rangers game last night, I had my entire afternoon and evening to myself. Yippee! After lunch, I walked 2 miles with my good friend Kelly -- she's been swamped with the start of school and learning the names of her ~600 students (elementary music) -- so we haven't talked much this past week. It felt so good to exercise a bit and to catch up with Kelly. I have got to work on getting exercise into my routine on a more regular basis. Then I went to the grocery store, read the newspaper, made this really fabulous corn dip and yummy chocolate chip cookies to take to a work outing at the Cowboys/Titans football game tomorrow night. Should be fun - but it'll make for a long day. Now, I will enjoy resting for the remainder of my Sunday evening, perhaps watch the closing ceremonies of the Olympics, and try to go to bed early. When I was a senior in high school, I was able to donate blood for the first time. Meek Blood Center hosted a blood drive in the auditorium foyer of Abilene High School. One reason I gave blood that day was that it was an excuse to get out of class. But another reason is that I'd seen the example my dad set by giving blood on a regular basis. Did you know that if every eligible donor gave blood just 2 times a year, there would never be a blood shortage? And that every 2 seconds someone needs blood? Since then, I've discovered another donation form that is just as valuable, if not more so, than whole blood. It is called Platelet Apheresis -- a process where I can give just one specific blood component - platelets - that are used primarily in cancer treatments. It takes a little time, but isn't a donation of a few hours of my time worth saving someone's life? One of my goals is to become a 2-gallon-per-year donor. My method for reaching this goal is to donate platelets 16 times throughout the year. (You can give whole blood every 8 weeks and platelets up to 24 times per year.) Today marked my 9th donation of the year and brought me to a lifetime donation level of 9.5 gallons. So, I might not make 16 donations this year, but setting a goal forces me to plan ahead and schedule donations on a regular basis. Please, please become a regular blood donor. Check out this link to Carter Blood Care where I donate in Dallas to find out about all the different donation types. Wherever you live, there is a donation site somewhere nearby. The American Red Cross provides a lot more information on their website - Give Life - about blood donations and can help you find a donor center near you. Someday you might need a unit of blood to save your life....don't you hope there is someone out there giving life for you? I am really glad that it is Friday....it's been a weird week and I'm ready to get a fresh start. I get to go shopping with my sister tomorrow morning (not too early, though, still get the benefit of a Saturday morning to sleep in a little!). Then tomorrow night I am going to a Rangers baseball game with some friends from church. Plus, I'll get to see my parents for a bit! They are bringing a special group of international students from ACU to their first baseball game -- check out the press release to read more. It's a pretty cool story. .....according to Webster, definition #2 it is "to deal with or treat others in a patronizing way." Now, I know that I am not perfect. I never claimed to be. Sometimes, I know that I think I am more perfect than, in actuality, I am. However, please spare me the condescending platitudes and "all-knowing" comments....on any and all subjects. It is one of my pet peeves -- and perhaps, sometimes the comments I perceive as condescension are unintentionally stated as such. BUT, just a word from someone who has endured quite a few platitudes (a trite and shallow idea or remark) lately -- think about what you are going to say before you actually say it. Think about how it will be received....and perhaps censor yourself before the comment escapes that will do emotional damage to someone else, rather than whatever positive outcome you can envision. Take it from an expert -- it's not much fun. And I speak from both sides of the coin. ....or maybe it is just that deep-down, I am a geek. I have several friends that I've mentioned this new hobby to. Their response is always "what? a blog? what is that?" One of the blogs I read wondered this week if this is a hobby, disease or addiction. For me, it is a new hobby. But, if I am not careful, I could spend all my time surfing the 'net, clicking from blog to blog to comment to profile to blog. Crazy. It is a whole other world! It is interesting to me what a community this has become -- and just like the real world, there is lots of wacked stuff out there -- but it provides a venue for people to share thoughts, prayers, rejoicing, questions and to be connected to other people that they may never meet face to face. As I've read through so many different blogs and comments, making comments of my own along the way, I'm connected to people that are connected to people that I am directly connected to. What a small world it really is when you start talking! There is a relatively new group that I have really come to love listenening to in the past few months.....Casting Crowns. The first song that I heard (on the radio) from their album was "Who Am I" - it is a song that reminds us that it is not because of who we are or what we do that we are loved by God, but because of who He is and what He has done. Powerful. But the song that has me enthralled of late is called "Voice of Truth" -- it has been speaking to me directly as I have been struggling with hearing and believing the truth of God's love and assurance over the lies that Satan feeds me daily. I am certain that I am not the only one who struggles with this .... so maybe posting these words here will touch someone else too -- and then you'll go and buy the album! .....when sour cream goes bad, does it become sweet? hee hee...just a funny thought that continues to make me laugh - and a glimpse at my warped sense of humor! Two blogs I read this week talked about motherhood and the joys/stresses of being a stay-at-home mom. One of the desires that God has placed in my heart is to be the very same - a stay-at-home wife and mother. However, as of yet, I still have not found the man that is to share that desire with me as my husband and the father to my children. When I share this dream with others, they often deride it, saying that surely I don't want to "waste" my talents and abilities and give up my career to be just a stay-at-home mom. I know that there are many ways in which I use other talents and abilities that God has given me - right now that includes a career in accounting. However, I strongly believe that when His timing is right, I will be granted the desires of my heart. Then I will get to learn how to use more of the talents and abilities that He has given me -- and will learn how to juggle what I am currently spending time on with changed priorities. I wonder sometimes, why it is that I have to struggle with this desire. Really and truly, the only reason that I am working a full time job right now is because I must work full time in order to support myself as a single adult. But, the over-arching desire in my heart is to be a stay-at-home wife and mother. One of those blogs I mentioned earlier - the mom in question is only a couple of years older than me and has 4 kids! Sometimes, I truly can't imagine what it would be like if my life had gone the way that "I" had planned it to this point. I am certain that I will look back in time and see God's hand in the path of my life. I hope and pray to see that path leading to a husband, family and children. However, if, in fact, my life's path does not venture that direction, I know that I am doing everything I can to listen to God's gentle whisper and following His leading for my life. By doing that, I know I can't go wrong. And I know that He will guide my life in His timing - His pure and perfect plan for me. And if it never looks like "my" plan, then I have to trust His plan. Because He loves me. I really love babies -- and since I am as of yet unmarried, I have to get my "baby fix" whenever I can. Tonight I was privileged to hold Henry, the son of my friends Heather & Chad. Henry was born at 1:53 pm this afternoon. When I arrived at the hospital after work, I visited with Heather for a bit, then went down to the nursery to see him. I watched the nurse give Henry his first bath and put on his first diaper. By about 6:45, they brought Henry to the room and about 7:20 I got to hold him. Wow! Only 5 1/2 hours old! He is so precious - probably the most beautiful baby I think I've ever seen. Perfect, long fingers, lots of dark hair and definitely his daddy's ears. I am sure that once I have children of my own, I will think that they, of course, are the most beautiful, perfect, angelic babies in the world. But for now, I count myself privileged to have been able to spend a few minutes with Henry in my arms. So, I am trying out some of the bells and whistles....check out some new links in the sidebar. Today it is cooler than normal (mid-80s for August in Dallas is great!) and rainy. On a rainy day, I'd love to be able to stay snuggled in my bed with a good book or watching a movie. Alas, I must be at work, earning my paychecks. Speaking of reading, I started a new book today over lunch. "The Bourne Ultimatum" by Robert Ludlum. I haven't read the first two books, but loved the movies, so I thought I'd read this last one before the next movie comes out. So far (pg 37) it is pretty good....if I can just match the faces in my head from the movies with the names I am reading, I should really enjoy it! I wish I had more time to read like I did in high school and college - I read so fast I completely devoured any book I picked up. Now, it makes me more tired to read than it did before, but I do still love it. I need to start turning the TV off and picking up a book more often. 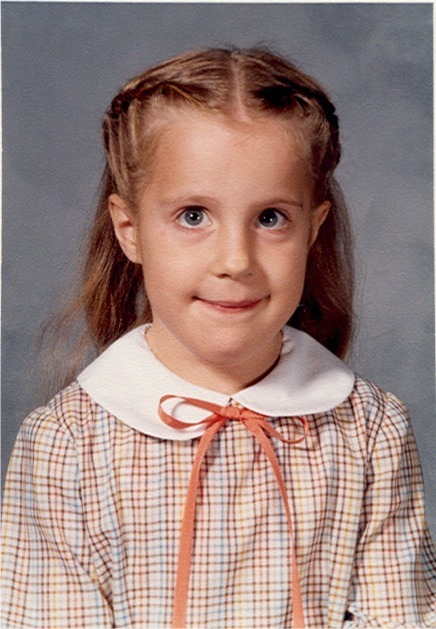 Reading all the nostalgic posts about starting school reminds me of my very favorite picture of myself - on my first day of kindergarten in 1981. You know, being a CPA, I should enjoy dealing with money - counting it, managing it, rearranging it. And I don't mind it at work. But I really hate managing my own money. Balancing my checkbook, paying credit card bills (virtually all my bills are charged automatically to a credit card that I pay off each month - that at least, is some small relief), moving money to savings, even *gasp! * thinking about long-term financial planning.... Why is that? Am I just lazy? Do I just want someone else to take care of the details? Funny, this trait seems to also spill over into my spiritual walk. I go to church every time the doors are open, participate in more ministries than I can count and have a hard time saying no when asked to do one more, throw up a prayer when I think about it (like driving in my car to work).... but do I sit down, with the TV off and read my Bible or spend quality time in prayer? Not nearly as often as I should. Why is that? Am I just lazy? Do I just want someone else to take care of the details? I want to have a deeper faith, a closer relationship with my Savior -- why do I continue to let Satan woo me with the lie that I don't need to work at it? Just things to ponder. And conviction that I need to keep working on that relationship - it's not magic. Why is it that it is so hard to get up earlier in the morning? I know that I am a morning person - once I am up, I am up. But it is so easy to snooze just one more time -- then the time anticipated to be gained by getting up earlier is gone and it is just another morning. ....and trying to decide if this is something that I need/want to do! I don't know that I really have anything to say - or anything someone else needs to hear. But, here's to trying it out. No, I am not a writer. I'm not even a thinker....at least not in the deep, philosophical realm. But, I am a reader - I've read bunches of blogs and made a few comments. This won't be a daily update - at least not at first. But people have told me I should blog, so here I am.